Some books are fun to read; some provide lighthearted motivation or encouragement. 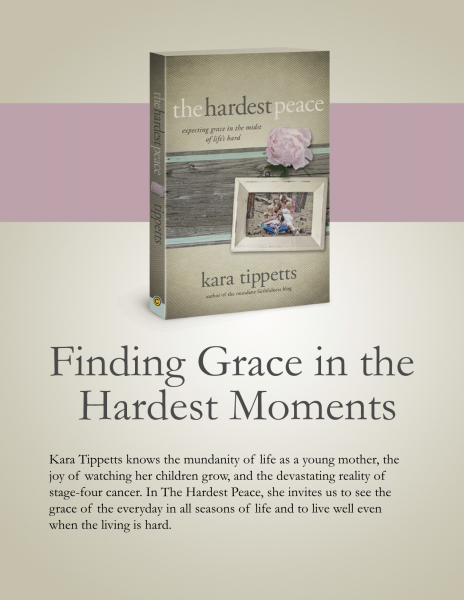 Kara Tippetts’ book The Hardest Peace is neither of those. It is filled with hard circumstances and stories, and challenges readers with the more difficult questions about faith, trust, peace, and God’s goodness. This was not an easy book to read. I was confronted with my own selfish desires for comfort and ease, for a pain-free and “blessed” life. Kara challenged my notion of what blessing actually means. There, I said it. 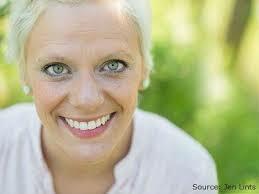 I can say that cancer and suffering give the beautiful gift of perspective. It is the gift you never wanted, the gift wrapped in confusion and brokenness and heartbreak. It’s the gift that strips all your other ideas of living from you completely. The beautiful, ugly raising to the surface of the importance of each and every moment. Jason often says marriage is the fast road to sanctification. Sanctification–the beautiful and sometimes painful refining of a soul, the kindness of God to involve Himself in our growth in grace. Marriage is often the beautiful tool He uses to shape our lives and expose our edges. Several times, while reading, I found myself fighting back tears as I thought through the hard and beautiful truths. At the end of each chapter there are questions for the reader–tough questions–to help you process those truths and apply them, no matter what your situation might be.